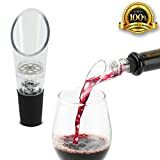 MAKE YOUR $8 WINE TASTE LIKE $20 WINE: This is the perfect aerator pourer for sub-$15 wines. Instantly taste the nuances in your red and white wine. Double the value of your wine by simply pouring yourself a glass! BUY 1 GET 1 FREE: We include an extra airator to bring for parties. Makes for perfect gifts! Great value -- compare with Vintorio, Vinturi, Vinara, Zazzol, and Coravin! DESIGN: Small air chamber infuses air into wine using the Bernoulli effect. Sturdy plastic with rubber cap is easily washable and ready to use immediately. Pour from your favorite bottle into any glass, crystal cup, or carafe. SIMPLE: Easy cleaning by running under warm water. Perfect travel companion. BUY WITH CONFIDENCE: 100% money back Guarantee. We will make it right.